We are extremely proud to announce that Ambient Life photographer Tim Wallace today has been confirmed as receiving the much coveted Royal Photographic Distinction Award for Associateship. The awards are made each year to those professional photographers that openly demonstrate not only excellence in photography but also can demonstrate how their own 'professional and applied' work has directly benefited their clients businesses. Each year the Royal Photographic Society makes these awards under several categories and levels of achievement. The most common award for a professional photographer to attain to is the Licentiateship award often noted after a photographers name by the letters LRPS, this award is given for proven ability in the technical art of photography. The Professional Applied Associate Award (ARPS) is the highest award next to actual Fellowship of the society, and is gained through the photographer demonstrating over 15 pieces of submitted work not only their high technical ability in their field but also it examines their create ability, their achievements within their field, and also from a professional business standing what they have created as a benefit to their clients businesses directly. 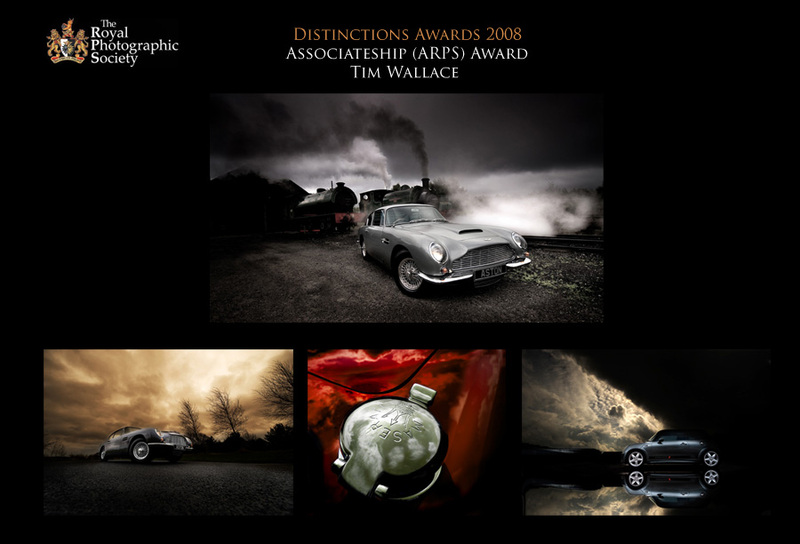 The Royal Photographic Society awarded Tim Wallace the Associate Distinction on 8th May 2008 for not only his professional and creative ability but also for the success and passion that he demonstrates within photography. Tim's clients who include Aston, Kenwood in the US have seen a documented and proven benefit to their business through the high quality photography that Tim creates with Aston realising an increase in Classic Restoration Car Sales rising £2.8 million over the last 12 months whilst enjoying an increase of 35% on enquiries both from the UK and abroad. Tim Wallace - "This is a great honour for me and quietly I'm really pleased that my work has been recognised in this way by the Royal Society. The associate distinction is not something really that you win, more earn it through your own passion and drive within the field of photography. 2007 was a great year for Ambient Life and we have seen some very big clients attracted to our work such as Cullina Logistics and Kenwood in the US, this is a strong indicator for me that we are not only unique in our product, but also that we are building an all important solid business reputation for service and quality. At first I was not sure about the award and was approached back in February by a member of the Society to make an entry, I never imagined that I would succeed first time round but I'm very glad I did take the opportunity. The feedback from the judging panel was very positive indeed and of the 15 pieces of work submitted for the case 4 of them were commented on as being potentially capable of gaining the highest award of Fellowship. I've been asked to work with the Society over the following months this year to drive forward and aim for this final level award and its something that I'm very interested in doing. Not only will it be a fantastic accolade for Ambient Life but also it will give me the opportunity to work with people passionate about photography, and guide others taking this journey in the field of professional photography."